A Cyber Center of Excellence commissioned economic impact analysis and workforce study has found a 14.7 percent increase in cybersecurity related jobs in just two years. Watch the live feed of the CCOE 2016 Cybersecurity Economic Impact Analysis and Workforce Study press conference. SAN DIEGO--(BUSINESS WIRE)--Cyber Center of Excellence, a San Diego-based nonprofit organization dedicated to accelerating the region’s cyber economy, recently commissioned the San Diego Economic Development Corporation (EDC) to conduct an economic impact analysis and workforce study on the current state of the cybersecurity industry in San Diego. The study was conducted to help quantify the economic impact, understand employer sentiment, analyze growth and changes since the EDC’s previous study in 2014, while diving deeper into workforce needs. The study shows that San Diego has more than 104 core cyber firms that employ 4,230 people in the region and the Navy’s Space and Naval Warfare Systems Command (SPAWAR) adds an additional 3,390 employees to San Diego’s cybersecurity industry. In total, there are 7,620 jobs – up 14.7 percent from 2014. According to the study, San Diego’s cybersecurity industry generates more than $1.9 billion in GDP and impacts 16,580 jobs annually – equivalent to hosting four Super Bowls or 14 Comic-Cons each year – and has grown by more than 26 percent in just two years. More than 51,000 technology specialists call San Diego home and work in a variety of cybersecurity-related occupations. Employers surveyed expect their cybersecurity workforce to grow by 13 percent in the next year compared to projected 2 percent overall regional job growth. The study also conveyed that the cybersecurity industry has moved significantly toward private sector customers, as the share of firms focused primarily on the commercial market has grown substantially to 47 percent. Access to clients, customers, vendors and suppliers are seen as San Diego’s greatest strengths among cyber employers. The economic impact study results will be broadcast live on Periscope on Thursday June 23, at 10:30 a.m. PST / 1:30 p.m. EST. All members of the national media are invited to view the live stream of the press conference. Watch the live feed of the CCOE 2016 Cybersecurity Economic Impact Analysis and Workforce Study press conference. The Cyber Center of Excellence (CCOE) is a non-profit organization that supplies the leadership and fosters collaboration, to establish San Diego as a worldwide center for cybersecurity products and services. Working together to build programs that promote cyber best practices among the key economic pillars of our community, and by promoting talent acquisition, retention and development, the CCOE aims to make San Diego a magnet for an industry that already provides 16,500 jobs and invests $1.9 billion into the San Diego economy. Learn more at www.sdccoe.org. 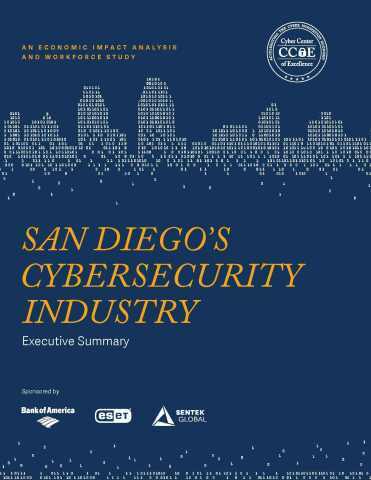 CCOE, a San Diego-based nonprofit dedicated to accelerating the region’s cyber economy, has released an economic impact analysis and workforce study on the current state of the cybersecurity industry.